Why Choose Delaware for Online Higher Education? The best way to get a high-paying job in Delaware is to earn a degree from an accredited university. A 2015 study found employees with bachelor’s degrees earned $58,000 a year, compared to $33,000 for those without a degree. Those with a busy schedule or difficult commute should consider an online program at one of Delaware’s three accredited universities. In this guide, we have answered questions about affordability, enrollment dates, deadlines, and financial aid associated with these programs. There is much to consider when choosing an online college. 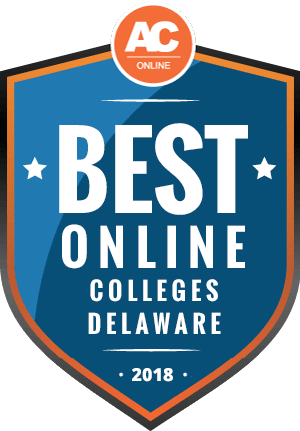 We have ranked the top online schools in Delaware based on cost, program options, student services, and by peer-based value (PBV). PBV compares Delaware’s universities to similar schools, helping you find the option that delivers the best value. Online programs in Delaware reflect the state’s shifting economic identity, with degrees offered in medical, business, and tech fields. More than 6,000 students attend online classes in Delaware. The state’s online schools draw many out-of-state students. A growing number of international students are also taking advantage of Delaware’s online programs. Delaware is one of the most expensive states in the nation to earn a college degree, and the state’s online programs generally reflect that. There are only 17 states with higher average tuition costs, according to the National Center for Education Statistics (NCES). In-state students generally spend less money than out-of-state students on tuition; however, out-of-state students should not be discouraged, they can still find value at Delaware schools. Wilmington University charges the same tuition for in-state and out-of-state student online learning and offers the widest variety of programs in Delaware. University of Delaware and Delaware State University participate in a program that allows students in 14 other states to pay in-state tuition rates. The average cost of tuition in Delaware is slightly higher than the U.S. average. Students who pursue an online degree will not see a lower tuition rate compared to students earning on-campus degrees. New education partnerships are attracting out-of-state students to Delaware’s universities, offering value with benefits such as a in-state tuition costs. The Academic Marketplace (ACM), part of a regional alliance of southeastern U.S. colleges and universities, allows out-of-state students to pursue a degree while paying in-state tuition costs. National Council for State Authorization Reciprocity Agreements (NC-SARA) is an alliance of the nation’s best online programs. It allows prospective students to qualify for online programs across the country and offers support to students if conflicts arise. Other states include Alabama, Arkansas, Florida, Georgia, Kentucky, Louisiana, Maryland, Mississippi, North Carolina, Oklahoma, South Carolina, Tennessee, Texas, Virginia, and West Virginia. In Delaware, only University of Delaware and Delaware State University are members. SREB has a program called the Academic Common Marketplace (ACM) that, in some cases, allows a student to pay in-state tuition at a school in another state. To qualify, a student must be unable to pursue the program in their home state. Students must be admitted to an eligible program before they can apply for the ACM discount. Students can potentially add new programs to the ACM. Learn more at Delaware’s Higher Education Office. All three of Delaware’s accredited universities with online programs participate in the National Council for State Authorization Reciprocity Agreements (NC-SARA). This centralized body oversees most of the nation’s best online programs, making it easier for prospective students to apply to schools across the country. NC-SARA has strict requirements for membership. It opens new online opportunities for students, reduces costs, and leads to better resolution of student complaints. Choosing the online college that fits your needs can be difficult. Below we have answered some important questions you should ask before you decide on a school. Do online credits cost more or less in Delaware? Delaware State University charges online students a $35 distance education fee. On-campus students have to pay a student activity fee, student center complex fee, and technology fee. On-campus students at University of Delaware will pay a $738 student comprehensive fee that online students do not have to pay. University of Wilmington charges online students the same fees as students on the main campus in New Castle. Which Delaware schools accept the most transfer credits? Wilmington University allows incoming students to transfer up to 90 credits. You can find out which classes transfer using the school’s credit transfer tool. Delaware State University also transfers a maximum of 90 credits. Find out which classes transfer on the school’s transfer admissions page. University of Delaware does not set a maximum number of transfer credits. Incoming students can use the school’s transfer credit matrix to determine which classes will transfer. Will any online colleges in Delaware accept a GED? The GED Testing Service says 97% of colleges and employers in the U.S. accept students who have completed the General Education Development (GED) program. University of Delaware, Delaware State University, and Wilmington University accept students who have a GED. Applicants must submit proof of their GEDs with their applications. GED recipients can learn more about preparing for college on the GED Testing Service’s College Readiness website. How many academic terms per year do online colleges in Delaware offer? Wilmington University offers online classes in 7-week blocks or 15-week semesters. Delaware State University offers classes in 16-week semesters in the fall and spring, and 8-week summer sessions. University of Delaware offers classes in 16-week semesters in spring and fall, and 5-week sessions during the winter and summer. Which online colleges will accept FAFSA in Delaware? All three accredited online colleges in Delaware accept federal aid. Students who want to receive federal aid must fill out a Free Application for Federal Student Aid (FAFSA). Delaware has a website called Delaware Goes to College designed to help prospective students apply for federal financial aid, state aid, and low-interest loans, and discover opportunities for scholarships. Are there any free online classes I can take from Delaware colleges? None of Delaware’s accredited institutions offer free online classes that can be used to help students fulfill graduation requirements. Wilmington University offers the state’s only free online course. My Dream Job helps students set attainable goals to develop a career path. The course can also familiarize prospective students with the online learning process. How can I find the online program options at Delaware colleges? The Delaware Department of Education’s Higher Education Office is the state’s central resource for students, including online learners. It details 12 state-sponsored financial aid programs, has a portal to apply for scholarships and monitor their statuses, and contact information for inquiries. Scholarships and grants can help students reduce tuition by hundreds or even thousands of dollars. For instance, the U.S. government gives Pell Grants to millions of students each year. In Delaware, there are several state-specific scholarships available to students who plan to attend an accredited college. Two scholarships are awarded in memory of former Speaker of the State House of Representatives, Charles L. Hebner. All high school seniors in Delaware with a 3.0 GPA or higher are eligible. One recipient must attend Delaware State University; the other must attend University of Delaware. Both must major in the humanities or social sciences. Political science students will be given a preference. The state awards approximately 50 Diamond State Scholarships each year. To qualify, students need at least a 3.0 GPA and a score of at least 1290 on the SAT. High school seniors in Delaware can apply. Women who have taken time off from college qualify for this award. Applicants must have had at least a two-year break from school, and a “C” average. Students qualify if an illness has postponed or interrupted their college education for at least six months. It is available to current and former high school seniors in Delaware. Zeta Phi Beta Sorority, Inc. offers this scholarship to African Americans, Latinos, and Native Americans who are currently in college. To qualify, students must be pursuing education studies with at least a 3.0 GPA. To be considered, applicants must be from New Castle County or enrolling in a Delaware college or university.